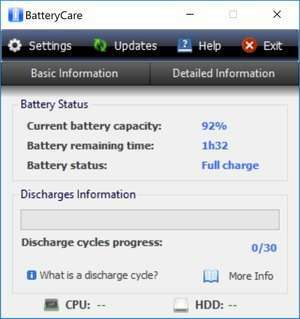 BatteryCare is an excellent freeware tool which can be used to monitor and improve the lifetime of your laptop's battery. The program includes a small and simple use interface, greeting users with a main panel which displays the amount of capacity the battery currently has, including the amount of time until discharge and its status. Basic and detailed information provided by BatteryCare include the battery model, current/designed/total capacity, charge and discharge rate, tension, wear, etc. BatteryCare has a number of options in the settings dialog, but most importantly, can be accessed from the Windows tray area by default. Version 0.9.33.0 is a freeware program which does not have restrictions and it's free so it doesn't cost anything. For security reasons, you should also check out the BatteryCare download at LO4D.com which includes virus and malware tests. Additional screenshots of this application download may be available, too.